HOTEL KAFIR:Apartaestudios y Habitaciones en Bogotá Colombia. Hotel cerca al aeropuerto en Bogotá, Corferías y la Embajada Americana. Alojamiento Economico en Bogotá! Hotel Kafir, su mejor opcion. Corferias y la Embajada Americana. Corferias and the American Embassy. Somos su mejor opción de Alojamiento en Bogota! Where to stay in Bogota? Your best choice of accommodation in Bogotá. Attend a concert or sporting event in Bogota . HOTEL KAFIR is your Hotel in Bogota close to Estadio El Campin Coliseum and the Sports Palace. Shopping in Bogota. HOTEL KAFIR Your Hotel in Bogota close to Salitre and Gran Estacion Mall , Salitre Magico and Maloka. 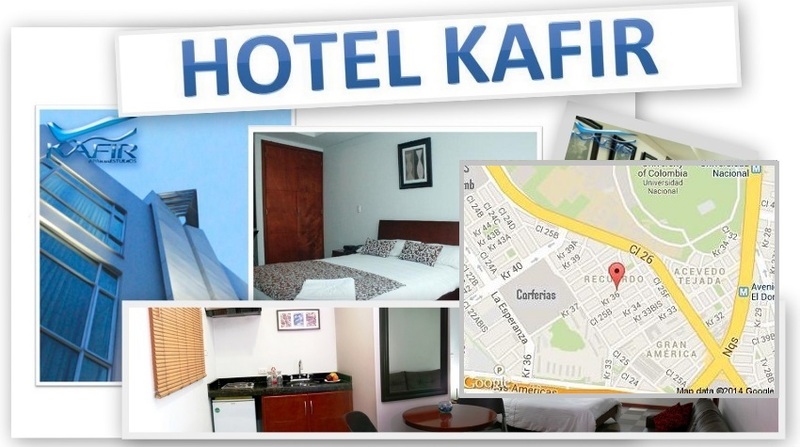 HOTEL KAFIR is your hotel in Bogota near the Outlets of the Americas and Industrial Zone . Close to 3 stations of Transmilenio . Looking for a hotel close to the center of Bogota? Do not take unnecessary risks, HOTEL KAFIR is your Hotel in Bogota near the city center . Looking for a hotel close to the airport in Bogota? Do not take unnecessary risks, HOTEL KAFIR your hotel in Bogota near the airport.